Add $100.00 to your cart to get your free gift! Free gift on orders $100+. Must add to cart. 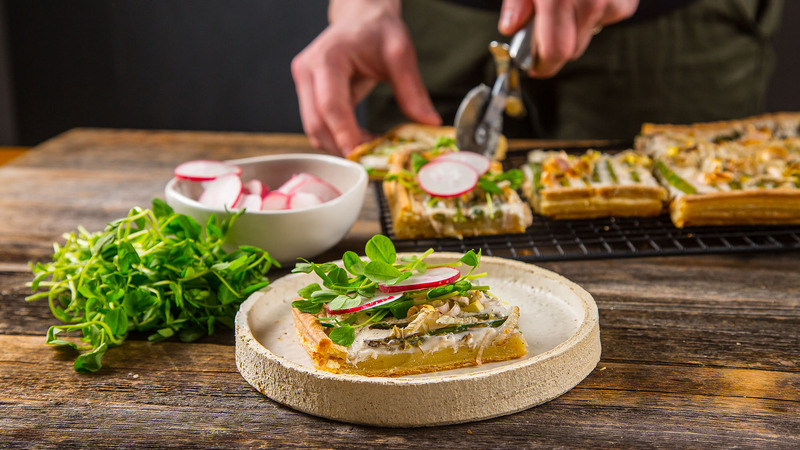 Grab the freshest asparagus, leeks, fennel, radishes and pea shoots you can find and make a decadent savory tart. You can whip this spring tart up in a flash by using a sheet of puff pastry. But if you’d rather make it all for scratch, or ensure it is gluten-free, you can make your own gluten-free crust using the recipe below. Preheat oven to 325F. Line a sheet pan with parchment paper and grease paper and any part of pan not covered. Combine almond flour, non-dairy butter, baking soda and salt in food processor, mix until combined. Add water 1 teaspoon at a time until a dough ball forms. Press dough into pan and up sides of pan, reinforcing the corners. Cover dough with foil and weight the dough down with a layer of dried beans. This helps the dough keep its shape as it parbakes. Bake for 15 to 20 minutes or until lightly browned. If using puff pastry, roll sheet out onto floured surface and transfer to parchment lined sheet pan. Use a paring knife to score a border ¼ inch from the outside edges. Stab pastry a few times to allow air to escape when baking. If not using puff pastry, grab your gluten-free crust from the oven. Spread non-dairy cream cheese or cashew cheese on pastry or gluten-free crust. (Cream cheese too stiff to spread? Thin it with hot water, 1 teaspoon at a time until it is spreadable). Arrange spring vegetables on top (not including radishes or fresh greens) and season with salt and pepper. Bake for 20 to 30 minutes or until vegetables are tender. Top with fresh greens, radishes, fresh ground pepper and olive oil.